Nakata, Y. (2014). Self-regulation: Why is it important for promoting learner autonomy in the school context? Studies in Self-Access Learning Journal, 5(4), 342-356. Both researchers and practitioners in the field of foreign language education are increasingly interested in the notions of self-regulation and learner autonomy. Indeed, there is a growing body of evidence highlighting the importance of self-regulation in promoting learner autonomy. For many practitioners, an important question to be addressed is how to help learners become more self-regulated in order to promote their learner autonomy. As it stands, however, the majority of learner autonomy research following this line of inquiry has been conducted within the framework of language learning strategies. Although learner autonomy research conducted within the framework of language learning strategies has to some extent contributed to addressing the question above, it has not provided enough guidance to practitioners and practitioner trainers, especially those who are struggling to promote autonomy in their learners in the EFL school context, which is full of constraints and limitations and does not allow much freedom. The present paper attempts to fill this gap, first by comparing the roots and the avenues of development of these two (essentially related but) distinct research areas—self-regulation and learner autonomy—and then by integrating the notion of self-regulation within the theoretical framework of learner autonomy, together with other notions of agency, teacher autonomy and scaffolding. For those of us involved in this field, it is our right as well as our responsibility (either as a teacher or a researcher or both) to keep searching for a better definition of learner autonomy. Insofar as it is an acceptable definition of learner autonomy (i.e. showing some relation to taking charge of one’s learning), it is also our responsibility and right to find better ways of promoting autonomy in our learners. In this regard, it is certainly true to say that there exists a wide variety of pedagogical approaches of promoting learner autonomy potentially suitable in each educational context. Learner autonomy must be a reality not merely a name or slogan. It is for this reason that learner autonomy research should be responsible for providing more concrete answers to the question of how we can help ‘our learners’ to become more autonomous, including in the EFL school context where not much freedom is allowed. It is therefore not surprising and entirely natural to consider that incorporating the notion of self-regulation into the framework of learner autonomy (with a focus on how it contributes to learners’ processes in becoming more autonomous) may shed a brighter light on the developmental aspects of learner autonomy. This would certainly be helpful for those teachers who are endeavoring to promote autonomy in their learners in EFL school contexts which are full of constraints and limitations and thus do not allow for much freedom (due to e.g. the fixed curricular goals, large class sizes, textbook- and exam-oriented teaching, and teacher-fronted instruction). Although I believe that it is the individual teacher who knows how best to promote autonomy in his/her learners, even in the school context, and that it is ultimately one’s own responsibility to become able to do so through a trial and error process, I argue that there is great potential for learner autonomy research, through the integration of the notion of self-regulation, to provide teachers with more concrete suggestions. However, the majority of the existing learner autonomy literature following this line of inquiry has been conducted within the framework of language learning strategies (e.g. Wenden, 1991; 1998) and does not necessarily provide a ‘sufficient’ account of either the relationship between learner autonomy and self-regulation nor the benefits of the possible inclusion of self-regulation within the framework of learner autonomy research (at least, to the extent that practitioners can make sense of it). As a result, our picture of the relationship between learner autonomy and self-regulation still remains incomplete and partial. This is mostly the case in secondary school EFL contexts, but is also an issue in tertiary EFL contexts where learners bring with them ideas and approaches accumulated from their previous language learning experiences at secondary school. Accordingly, the present paper will attempt to offer insights into how these two concepts can be integrated, both from a theoretical/conceptual perspective and an educational/pedagogical perspective. I begin by describing the background of self-regulation and learner autonomy; based on this account I then attempt to show how they interlink with each other. Next, I discuss the role of self-regulation and teacher scaffolding in the EFL classroom, which is necessary for the learner’s shift from being teacher-dependent to more autonomous. With these two cornerstones in place, I present a view of self-regulation that will hopefully create a foundation for discussing how self-regulation can be situated within the framework of learner autonomy. The whole argument of this present paper is based on the premise that self-regulation can contribute to the development of agency toward the achievement of learner autonomy. Teachers’ awareness of theory and practice regarding self-regulated learning is an important step towards the realization of teacher autonomy (see Andrews (2007) for a discussion of teacher language awareness). This can provide teachers with concrete ways of scaffolding students’ learning and therefore help them too become more autonomous. Viewed from a historical angle, learner autonomy research and self-regulation research have different origins and roots. Broadly speaking, learner autonomy research has been developed primarily in the field of applied linguistics within a qualitative/interpretative paradigm. The concept of autonomy itself was originally imported from the fields of politics and moral philosophy, and has been discussed in the language learning academic sphere over the last 20 years mostly in Europe and in more recent years in Asia and South America (see Benson, 2011; Smith, 2008). For its part, self-regulation research, whose genesis lies in cognitive psychology, developed out of a quantitative/positivistic research paradigm. It started in North America and then expanded to Europe. It may not be too much to say that both of these constructs have increasingly gained more recognition among scholars in different parts of the world. Self-regulation research, with a specific focus on its developmental processes, is beneficial not only to self-regulation researchers but also to educational practitioners in that it helps explain achievement differences among our students and teaches us how to improve their achievement (Schunk & Zimmerman, 2008, p. vii). Understanding the mechanism of self-regulated language learning helps both researchers and teachers to delve deeper into what is exactly impeding and promoting learners’ self-regulation and to speculate about ways of scaffolding their learning. Given this importance, researchers in the fields of language learning motivation and language learning strategies have gradually started to engage with the study of self-regulation. In the last decade or so, we have indeed witnessed vibrant discussions of self-regulation, but mostly either as an alternative to or an extension of ‘language learning strategy’ research whose primary focus is more on the cognition and behavior of successful language learners (Griffiths, 2008; Rose, 2012; Tseng, Dörnyei & Schmitt, 2006; also see the 2012 Special Issue on Strategies and Self-Regulation in Self-Access Learning of this journal) or ‘motivation’ research whose primary focus has often been more on affective issues relating to unsuccessful language learners (Nakata, 2006; Ushioda, 2008). In more recent years, however, we see more studies that attempt to comprehensively explore all aspects of language learning—cognitive, behavioral, and affective—also without limiting themselves to either successful or unsuccessful learners alone (Bown & White, 2010; Nakata, 2010; Rose & Harbon, 2011; Tsuda & Nakata, 2013). At least as far as the pedagogical implications of these studies are concerned, it may be fair to say that while it typically remains ‘implicit’, autonomy seems to be the ultimate goal of developing learners’ self-regulated learning skills. Admittedly, most classroom practitioners are waiting for research that reveals the self-regulatory processes of both successful and unsuccessful learners (and, more precisely, what is exactly impeding and promoting their learning) that would thereby help them to think about their own approaches for cultivating autonomy in their learners (i.e. supporting the shift from being teacher-dependent to more autonomous). This is an issue we must address urgently and it is one that cannot be answered exclusively by the existing self-regulation research literature. Self-Regulation and Learner Autonomy: How Are They Related? With the rise of self-regulation research not only in educational psychology (Boekaerts, 1999; Boekaerts & Cacallar, 2006; Schunk & Zimmerman, 2008) but also in applied linguistics (Bown & White, 2010; Tseng, Dörnyei, & Schmitt, 2006), there are growing calls for a clarification of the relation between self-regulation and learner autonomy among researchers in the fields of applied linguistics and TEFL (e.g. Lewis & Vialleton, 2011; Nakata, 2010, among others). While we are aware that there is a relation between them, it is as yet not entirely clear how they are related. In fact, theoretical discussion regarding the connection (e.g. Lewis & Vialleton, 2011) is still rather meager relative to that of the relation between language learning strategy use and self-regulation. Anecdotal evidence also seems to suggest that the same holds true for practitioners (Nakata, forthcoming). For some, autonomy means becoming more self-regulated in learning a foreign language, gaining better control of one’s own learning, and becoming a more autonomous language learner. For others, it means a learner’s psychological and physical freedom from external forces. Still, for others, it is a matter of intrinsic motivation. Admittedly, clarifying this relationship is an extremely difficult task to complete. Here I would like to offer my own theorization of this relationship. Figure 1 illustrates the possible integration of self-regulation within the framework of learner autonomy, postulating that learner autonomy is a more over-arching construct that self-regulated learning can be included within. It is perhaps true to say that self-regulation on its own is not enough to account for the development of autonomy in learners. Instead, it may be plausible to consider that its inclusion within the autonomy framework should be accompanied by such other factors as agency and teacher autonomy. The development of learner autonomy implies lifelong language learning; the endeavor to promote autonomy in learners means helping them to continue their learning throughout their lives. In this sense, the development of learner autonomy inevitably involves the evolution of a learner’s agency; one of the most fundamental characteristics of general human behavior defined as “a person’s ability to control their actions and, through them, events in the extended world” Haggard & Taskiris, 2009, p. 242) or an individual’s will and capacity to act (Gao, 2010; see Gao & Zhang, 2011; Toohey & Norton, 2003 for the relationship between agency and learner autonomy). In order to become an autonomous language learner, one must come to be able to not only self-regulate his or her learning but also develop a sense of agency in learning a foreign language. Those learners who are more self-regulated in learning a foreign language ‘skillfully’ are able to utilize that skill to become more responsible and autonomous learners, and thus are likely to develop a better sense of agency as a lifelong language learner. Furthermore, the development of learner autonomy is to a greater or a lesser extent dependent on the degree of teacher autonomy (Little, 1995; Smith, 2000). In other words, teacher autonomy seems to be a precondition for the promotion of learner autonomy in that those who wish to promote autonomy in learners must themselves be autonomous not only in their professional skills but also in employing practices for promoting autonomy (Nakata, 2011). More precisely, within the framework illustrated in Figure 1, teacher autonomy implies the extent to which teachers endeavor to help promote their learners’ self-regulated learning while helping develop their sense of agency, and as a result these two aspects together help promote learner autonomy. Importantly, all of these factors must be underpinned by a suitable educational philosophy (i.e. the characteristics we endeavor to cultivate in our learners, along with an ideal model of autonomous language learners). Otherwise, it would be difficult to put them together within the framework of learner autonomy. Taken together, this model attempts to provide a clearer picture of how the concept of self-regulation can be integrated within the framework of learner autonomy. Figure 1. Learner autonomy: drawing together the threads of self-regulation, learner agency, and teacher autonomy underpinned by educational philosophy (Revised from Nakata (forthcoming)). Learner autonomy has an important role to play for successful lifelong language learning, particularly in the EFL context where learners tend to have infrequent contact with native speakers of English and thus limited opportunities to use English. Successful language learning is unlikely to occur unless the learner as an active agent endeavors to take charge of his/her own foreign language learning throughout his/her life. Seen from the teacher’s perspective, simply stated, whichever the research paradigm (language learning strategies, motivation, or self-regulation) or educational context (ESL, EFL, exam-oriented learning, whole class instruction, or communicative language teaching, etc. ), the agenda common to those of us interested in the field of self-regulated learning seems to be to help learners move from being teacher-dependent to more autonomous, in other words, the development of learner agency (Gao, 2010; also see Ushioda (2001) for a discussion of L2 learner development of motivational thinking over time). Figure 2 depicts the development of learner agency toward the achievement of learner autonomy, showing how learner characteristics change when provided with the right kind of scaffolding. It postulates that, given appropriate support in the quality and quantity of learning, learners can be encouraged to become more self-regulated in learning a foreign language and gradually start to take more responsibility for their learning. In other words, agency is considered here as a prerequisite for the development of learner autonomy. Figure 2. Development of learner agency toward learner autonomy (Revised from Nakata (forthcoming)). Little (1995, p. 178) argues that total independence from the teacher, from other learners, and from formally-approved curricula is not autonomy but, rather, autism, suggesting the importance of interdependence for the development of learner autonomy. Perhaps, many, if not all of us, agree that the process of becoming an autonomous language learner needs both independence and interdependence, and thus support from teachers or colleagues is crucial to this end. Herein lies a role for scaffolding to play (Perry, Hutchinson, & Tauberger, 2007). Teachers need to be able to help their learners learn how they can better self-regulate their own learning, while helping to remove the problems and obstacles impeding their self-regulation. With the right kind of teacher scaffolding, each individual learner can come to better self-regulate his or her own learning, and thus begin to develop their agency with the goal of achieving learner autonomy. However, the answer to the question “what kind of or degree of support is appropriate for improving learners’ self-regulation in a given situation so that it will contribute to the development of promoting learner autonomy” still remains. Some teachers tend to provide learners with excessive support, resulting in the learners not receiving opportunities to exercise their skills or complete learning tasks on their own. In other cases we see teachers not providing any support and, furthermore, failing to encourage support from classmates when appropriate, leaving students in the dark. Still others move between the extremes of being sometimes over-supportive to at other times under-supportive. Teachers wishing to promote autonomy in learners through attempting to improve their learners’ self-regulation must be able to monitor their learners’ readiness for autonomous language learning, and thereby be able to provide each individual learner with the right kind of scaffolding at each different stage of the learning process (Nakata, 2010). In considering the right kind of support for promoting learners’ self-regulation toward the achievement of learner autonomy, Brophy’s (2004) idea of the cognitive and motivational zone of proximal development (ZPD) dimensions (above, within, and below ZPD: whether learners can do it on their own easily, manage to do it on their own, or cannot do it on their own) is particularly useful. In line with this idea, I developed the model shown in Figure 3 in an attempt to delineate the dimensions of motivational and cognitive scaffolding further, and provide a more detailed account of expected outcomes for different combinations of motivational and cognitive readiness. In this model, motivational scaffolding (i.e. experiences of small success and personally relevant tasks) consists of three readiness levels: ‘no interest’, ‘fun, enjoyable’ (affective/fun aspects) and ‘fun, enjoyable, meaningful, and worthwhile’ (affective/fun aspects as well as cognitive/learning aspects) (see Brophy, 2004; Nakata, 2009, 2010 for this discussion). Cognitive scaffolding (i.e. helping develop better language learning strategies) consists of two readiness levels: ‘not yet able to learn’ and ‘able to learn.’ The expected outcomes displayed in the shaded cells in Figure 3 can be considered as the result of the combination of these two types of scaffolding according to each learner’s degree of readiness (i.e. extremely limited outcome, limited outcome, high outcome for a limited amount of time, potential high long lasting outcome, high long lasting outcome). For example, when learners have motivational readiness for both affective/fun and cognitive/learning aspects, even with low cognitive readiness, their learning can be potentially long-lasting. However, the outcome of learners with a higher level of cognitive readiness (‘able to learn’) is likely to be limited in the case of low motivational readiness. 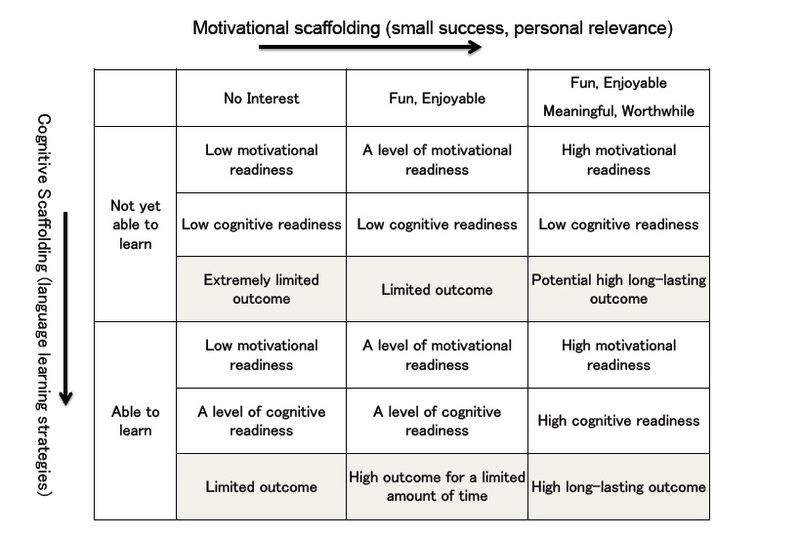 All in all, the model suggests that the right kind of scaffolding must be provided for each individual learner, carefully considering each learner’s readiness not only at the motivational level but also at the cognitive level. Figure 3. A model of motivational and cognitive scaffolding. The development of learner autonomy encompassing self-regulated language learning is dependent on teacher autonomy in that learners can become self-regulated in language learning, and thus autonomous language learners, to the extent that teachers can monitor learners’ readiness (motivational/cognitive), the obstacles to their self-regulated learning in light of cyclical phases of self-regulation (Zimmermann, 2011), and the gap in support between what learners need and what teachers provide. It is through the monitoring of these areas that teachers can come to be able to successfully narrow that gap and to offer their learners the right kind of scaffolding. This kind of scaffolding helps promote learners’ cycles of self-regulation, and, as a result, can help learners themselves to develop a sense of agency toward the achievement of their own autonomy as learners. As I argued earlier, I believe the inclusion of the notion of self-regulation into the framework of learner autonomy may help not only clarify perspectives of researchers working within different research paradigms, but also enhance our understanding of how teachers can support their learners’ development of autonomy, and contribute to the appropriate conditions necessary for this development. In particular, there are important roles for Zimmerman’s cyclical phases of self-regulation (Zimmerman, 2011) and the associated self-regulatory sub-processes to play for both naïve and skillful self-regulated learners (Zimmerman, 1998). For those practitioners who are wishing to promote autonomy in their learners (particularly in the EFL school context), understanding cycles of self-regulation (including what is promoting and impeding learning) is crucial. With the help of the theory of self-regulation, teachers can have a clearer image of what kind of autonomy their students should achieve and of how they can better help learners self-regulate their foreign language learning with the aim of developing learner autonomy. If this issue of the role of self-regulated learning is left unattended, it may be difficult for those working in teacher-training to provide teachers striving to help their learners to become more autonomous with the kind of concrete support that is required to meet this aim. In the edited volume “Jibunno ashi de aruku chikara wo sodateru: Gakushusha autonomy eno chousen” [Cultivating language learners who can move forward on their own: Challenge toward learner autonomy] (Nakata, forthcoming), I asked 12 secondary school teachers to outline their practices for promoting learner autonomy, including their own definitions of learner autonomy and the learner characteristics they wish to cultivate. Echoing Benson’s remark introduced at the outset of this paper, the contributors to this volume provided varied definitions of learner autonomy and practice dealing with different aspects of learner autonomy such as agency, self-regulation, teacher autonomy, social interaction, and strategy training. Yet, to varying extents, all of their definitions seem to contain at the core the idea of taking charge of one’s learning. Some are closer to “formal” definitions of learner autonomy (i.e. the one made by Holec), while others are more related to self-regulation (i.e. the one made by Zimmerman); however their voices seem to strongly suggest that it was their experience through the book project that led them to speculate about the meaning of autonomy and the nature of their practice, and thereby take the step toward teacher autonomy. It was for this very reason that I asked these practitioners to provide their own definitions of learner autonomy and characteristics of autonomous language learners. The wide variety of definitions of learner autonomy they provided offer compelling evidence in support of the argument for integrating the notion of self-regulation into the framework of learner autonomy. Needless to say, the theoretical framework provided in this paper must be further vindicated by empirical evidence. However, it is my hope that the present paper will help lay the foundation for the inclusion of the notion of self-regulation into the framework of learner autonomy. This is a revised version of a keynote speech presented at the symposium Self-regulation in Foreign Language Learning: Shared Perspectives held at Shimonoseki City University, in December 2013. Yoshiyuki Nakata (Ph.D.) is an associate professor of English language education and in the Joint Graduate School in Science of School Education at Hyogo University of Teacher Education. His research interests include language learning motivation, self-regulation and teacher/learner autonomy in the Japanese EFL context. Benson, P. (2011). What’s new in autonomy? The Language Teacher, 35(4), 15–18. Boekaerts, M., Pintrich, P. R., & Zeidner, M. (2000). Handbook of self-regulation. San Diego, CA: Academic Press. Brophy, J. E. (2004). Motivating students to learn (2nd ed.). Mahwah, NJ: Lawrence Erlbaum. Gao, X. (2010). Strategic language learning: The roles of agency and context. Bristol, UK: Multilingual Matters. Gao, X., & Zhang, L. J. (2011). Joining forces for synergy: Agency and metacognition as interrelated theoretical perspectives on learner autonomy. In G. Murray, Z. Gao & T. Lam, T., Identity, motivation and autonomy in language learning (pp. 25–41). Bristol, UK: Multilingual Matters. Griffiths, C. (Ed.) (2008). Lessons from good language learners. Cambridge, UK: Cambridge University Press. Little D. (1991). Learner autonomy 1: Definitions, issues and problems. Dublin, Ireland: Authentik. Nakata, Y. (2006). Motivation and experience in foreign language learners. Oxford, UK: Peter Lang. Nakata, Y. (2009). Intrinsic motivation in the EFL school context: A retrospective study of English learning experiences in Japanese elementary schools. The Journal of Asia TEFL, 6(4), 263–291. Nakata, Y. (Ed.) (forthcoming). Jibunno ashi de aruku chikara wo sodateru: Gakushusha ohtonomy autonomy eno chousen” [Cultivating language learners who can move forward on their own: Challenge toward learner autonomy]. Tokyo, Japan: Hitsuji Shobo. Schunk, D. H., & Zimmerman, B. J. (Eds.). (2008). Motivation and self-regulated learning: Theory, research, and applications. New York, NY: Erlbaum. Smith, R. (2000). Starting with ourselves: teacher-learner autonomy in language learning. In B. Sinclair, I. McGrath & T. Lamb (Eds. ), Learner autonomy, teacher autonomy: Future directions (pp. 89–99). Harlow, UK: Longman. Toohey, K., & Norton, B. (2003). Learner autonomy as agency in sociocultural settings. In D. Palfreyman & R. Smith (Eds. ), Learner autonomy across cultures: Language education perspectives (pp. 129–149). Basingstoke, UK: Palgrave. Ushioda, E. (2008). Motivation and good language learners. In C. Griffiths, Lessons from good language learners (pp. 19–34). Cambridge, UK: Cambridge University Press. Ushioda, E. (2001). Language learning at university: Exploring the role of motivation thinking. In Z. Dörnyei & R. Schmidt (Eds. ), Motivation and second language acquisition (pp. 93–125). Honolulu, Hawai‘i: University of Hawai‘i Press. Wenden, L. A. (1991). Learner strategies for learner autonomy. London, UK: Prentice-Hall. Zimmerman, B. J. (1998). Developing self-fulfilling cycles of academic regulation: An analysis of exemplary instructional models. In D. H. Schunk & B. J. Zimmerman, Self-regulated learning: From teaching to self-reflective practice (pp. 1–19). New York, NY: Guilford. Zimmerman, B. J. (2000). Attaining self-regulation: A social cognitive perspective. In M. Boekaerts, P. R. Pintrich, & M. Zeidner (Eds. ), Handbook of self-regulation (pp. 13–39). San Diego, CA: Academic Press. Zimmerman, B. J. (2011). Motivational sources and outcomes of self-regulated learning and performance. In B. H. Zimmerman & D. H. Schunk, Handbook of self-regulation of learning and performance (pp. 49–64). New York, NY: Routledge. Zimmerman, B. J., & Schunk, D. H. (Eds.) (2011). Handbook of self-regulation of learning and performance. New York, NY: Routledge.